SGN, the company behind many of the popular Wii-like games on the iPhone, has just released a new game to the App Store. Dubbed “Mafia: Respect and Retaliation“, the game joins a growing number of mob-based games on the App Store, some of which are growing to become immensely popular. Among the features that differentiate Mafia:R&R from its competitors are the ability to play the game while offline (other games typically require a network connection), use of the iPhone’s accelerometer to train in a virtual shooting range, and 3D graphics. The game is available for free, but also comes in a half dozen premium versions available for 99 cents, $5, and denominations up to $50. Premium versions grant gamers more skill points and higher rank, allowing them to establish their dominance more quickly. The app has been a long time coming. In January David Maestri launched a game called Mob Wars on Facebook Platform while he was employed by Freewebs, the company that SGN spun off from. The game has grown to become incredibly popular, with millions of users and rumors of monthly revenues topping $1 million. However, because Maestri was employed by Freewebs/SGN when he built the game, the company felt that the IP was theirs (as is commonly stipulated in tech employee contracts). For more on the legal drama, check out this post. After months of legal wrangling, Maestri and SGN reached a settlement, granting Maestri control of the Mob Wars app but rewarding SGN with a undisclosed monetary payment along with the rights to develop Mob Wars-like games. SGN’s Mafia game is one of the products of that agreement, and it certainly looks like it stands a chance at becoming another hit for the company. 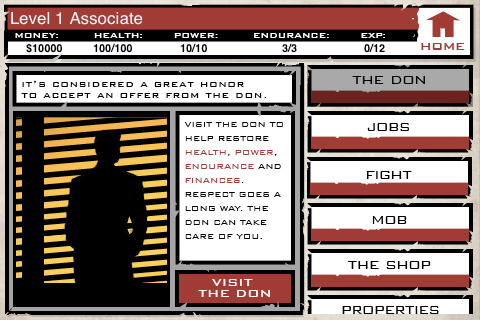 As with other similar mob-based games, Mafia:R&R is primarily text based, allowing gamers to complete jobs to rise through the ranks of organized crime, buying improved items along the way. These games can take some getting used to, but they can also be very addictive. Other popular mob games include iMob (covered here and Mafia LIVE!, currently the 7th most popular paid app on the App Store.